Hi Ya’ll! Today I’m very lucky to be interviewing C.B. 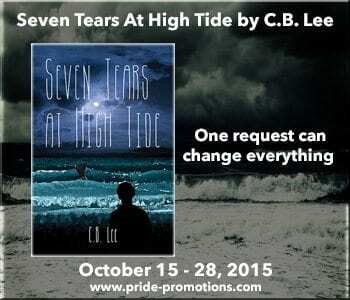 Lee, author of Seven Tears at High Tide.Hi C.B., thank you for agreeing to this interview. Tell us a little about yourself, your background, and your current book. Hello, thank you for interviewing me today, I’m quite honored to be here. I’m C.B., I’m grew up in California and I’m very passionate about writing, hiking, and traveling. I’m a first generation Asian American and I’m happy to be introducing some characters whose backgrounds are like my own. 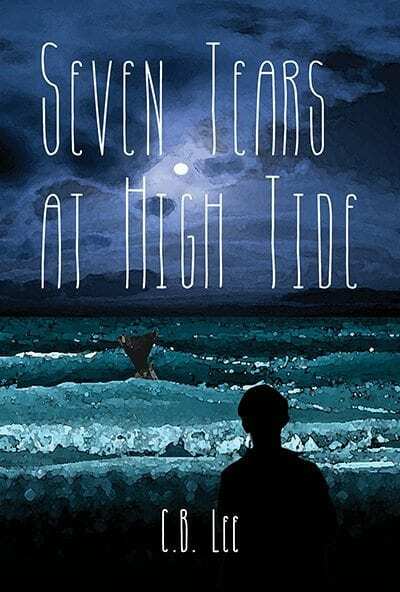 My first novel is Seven Tears at High Tide, a love story between Kevin and Morgan, who meet because of Kevin’s magical wish for a summer love and then have to deal with some complex choices when summer is over. The hardest for me is probably any type of angst or very heavy emotional scenes; particularly because I do write with emotion. I draw a lot on personal experiences to write, and I have to put myself directly into what the character is feeling, so often times my own mood will be directly affected. It’s really difficult if I’m not up for feeling that way, but I try my best. Emotion, definitely. I think good characters and an interesting plot will get you quite a bit of a ways but I think how all of it comes together and makes you feel is the best part. This is my first novel! I’m looking forward to what readers might say in the future. Seven Tears is my first novel, so it has to be my favorite for now. We’ll see as time goes by if that title will go to any of my other works. I love traveling, particularly hiking and backpacking and rock climbing! It’s not an everyday type activity, at least the traveling far bit, but I’m lucky to live in an area that’s abundant in beautiful scenery, whether I feel like heading up into the mountains, or to the sea, or to the desert. Some of my favorite hikes are along the coastal bluffs— catching the sunset as it falls below the horizon, dipping below the waves, canyons and cliffs catching fire with color. Or I might enjoy heading up in the mountains, with the constant sound of bubbling brooks coursing along rocks, streams full of fresh rainwater from the season, damp leaves on the trail, a cool wind at my back and a view of the city below. Thank you so much for stopping by! Now for a little about the book! Cover Artist: C.B. Lee Cover Design by C.B. 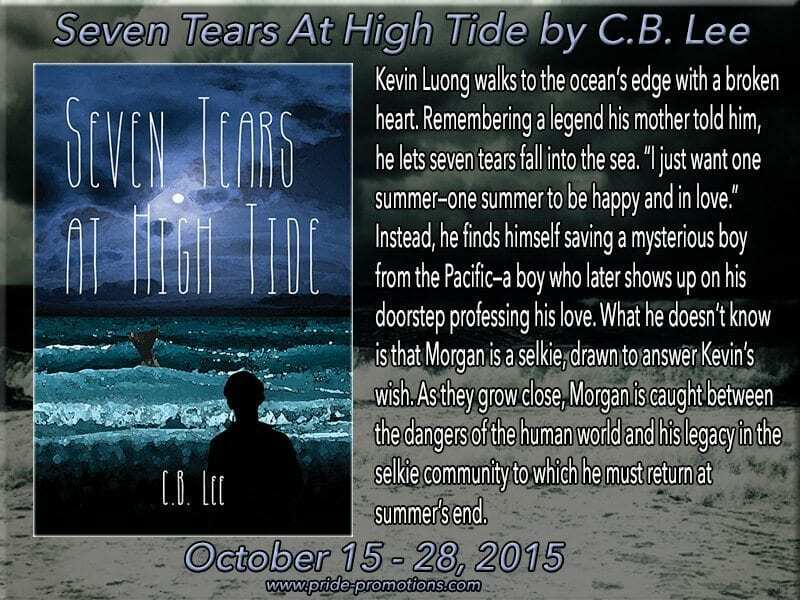 Messer Kevin Luong walks to the ocean’s edge with a broken heart. Remembering a legend his mother told him, he lets seven tears fall into the sea. “I just want one summer—one summer to be happy and in love.” Instead, he finds himself saving a mysterious boy from the Pacific—a boy who later shows up on his doorstep professing his love. What he doesn’t know is that Morgan is a selkie, drawn to answer Kevin’s wish. As they grow close, Morgan is caught between the dangers of the human world and his legacy in the selkie community to which he must return at summer’s end. This was a lovely story about young love, broken hearts, and hope. Kevin remembered an old folk Lore Story his mom told him about Seven Tears on the High Tide and in desperation he crys into the sea and makes his wish for Love for the summer, to hold hands, to not hide, to do things he enjoys. A seal shows up and makes him smile then soon after a young boy appears on his doorstep confessing he is his boyfriend. 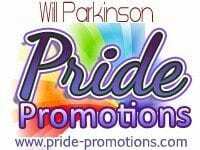 Everything about this story is charming, from the characters, storyline to the romance. It is very sweet and clean,magical and very funny, with a touch of suspense near the end. I absolutely adored Morgan. He is naive, sweet and confident i himself. I loved that the author put in that he was a bit chubby faced and not a six pack body image and still very confident. If you like sweet romances, Young adult stories, charming characters, and selkies you must read this one! Meet C. B. Lee: B. Lee is a bisexual writer, rock climber and pinniped enthusiast based in California. Lee enjoys reading, hiking and other outdoor pursuits. 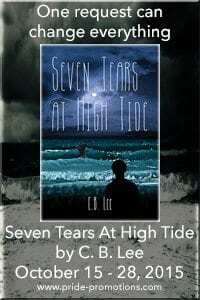 Seven Tears At High Tide is a first novel. You can stalk—oops Follow C.B. Website cb-lee.com, Facebook, https://www.facebook.com/authorcblee, Twitter @author_cblee, Goodreads: Goodreads.com/cb-lee. CB, I very much enjoyed hearing how emotion is so important to you when you write. Your story sounds amazing. Best of luck with it!